Yeah! Now it works well, thanks. In "/SieELF/MySMSYS/Patches" there are some patch files - for what purpose they made? And how can i make the same patch for S75sw52? Ok, I found it well in Inbox but some sms in Sent are somehow without date-time Browser shows it normally. Also noticed, that if Popup New SMS is disabled, when GUI is opened and at this moment new sms is coming, InNew or Inbox won't be updated (won't show new sms in any category) until you restart GUI. shortcut and native menu entry: inbox,sent,draft,archive,create new sms. create new sms: call records, addressbook, note/tasks/appointments, idle dial. and view/reply/forward in device inbox. and increase the count of mss file to the count of the message menu in native menu. 1.more own dialog CSM name. 2.fix, if notify is turn off, refresh the sms data. 3.continue to fix, if there is any new sms. 4.enable to insert all data of addressbook. 5.force to allow only one notify pop-up window. 6.if there is any other programm(such as simoco) did some change to the sms.dat, refresh sms data at once. this blinker maybe work well if you have applied the browser killer. Statistics shows wrong sms quantity because of 2-sized or more-sized ems. What about translit for Rus Release only? no, it should be WIN1251-coded. 1.fix, pop-up window auto close, and lots of notify pop-up window could be open at the same time again. i did the translit like this, i do not know if that is right. the translit will be done before the sms sent. BingK, can you add translit to polish? Hey BingK! :-) VERY much bingk thanks for your work! Mss-client is amazing! There is a disire of united nations, for somewhat lang.txt, for personal naming elf-menu items and so on. Critical! Show a number of segments of sms, when u type or view a message! We have very expensive sms on some net-providers..
Add a sms-counter. Show a number of incoming/outgoing sms (by fact) and a number of incoming/outgoing segments of them. Why we need to see a sms number (internal in sms.dat)? It's have no information for us, users..
Elf don't show an ends of long sms (but in phone they shown good, full). Sometimes an end of sms (last segment), sometimes, vice versa, only first segment is shown, all following - not. A delivery reports are not shown! There are no delivery reports, if sms was sended via elf. If we send via phone - they comes (to phone only). Does all incoming sms automatically move to elf's system or only after opening elf? I mean, for example, we enter to sms-chat, sleep at night, :] , sms comes to phone like waterfall, at morning we open elf - and all sms are there, a sms phone memory dosen't full, yep? Выводить только псевдоним (Имя отображения) или/и Имя и Фамилию, а не все сразу. Хотелось бы нечто вроде lаng.txt, чтобы назвать пункты меню эльфа самому. Уже писал, но чтобы все было в одном месте - выводить число сегментов sms при написании, просмотре sms. Добавить счетчик sms. Не по сегментам, как в некоторых телефонах, а по факту количества принятых/отправленных sms. Иногда неправильно отображает номера, вообще левые. Зачем нам нужен номер sms?.. Никакой информации не несет. Не отображает концы длинных сообщений (хотя в телефоне они отображаются). Иногда просто конец (последний сегмент), иногда наоборот - первый сегмент отображается, все последующие - нет. Не отображаются вообще статусы доставки! Не приходят статусы доставки, если отправить sms через эльф. Через телефон - приходят. Все Входящие sms из памяти телефона перемещаются в эльф автоматически или только после открытия эльфа? То есть, например, оставляем на ночь телефон, там сыпятся smsки. открываем утром эльф - все sms там, память телефона не заполнена, пуста. так? 2 BingK: last version works well, thanks. Can you create option to add icons on menu's chapters? It would be very nice, please. what about these Polish characters in uicode(HEX)? open mss-file via MssLinker.elf or MySMSYS.elf. the sms will be auto saved as file(if enable in MySMSYS.bcfg) when you view it. about the delivery reports, we can't get the "MSG_EMS_INCOMING" message when it coming, and it wouldn't be saved in sms.dat if you haven't applied to Browser-Killer or it is turn off. strangely, all the ems could be read well on my S7Cv47. 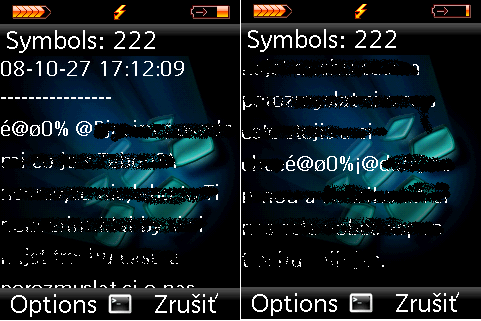 about a sms-counter, i think it is useless, sometime we send sms via Simoco or the Browser, it is not correctly. using a lang.txt file, that will be done in the future version. Still turn-off after open mss file with MssLinker.. or MySMSYS.elf..
Oh,i see situation with send-reports.. I usually use mail-client in phone too, cant kill Browser.. Eh. Thanks! Hope other wishes and bug-reports and question was heard.. In addition to my first bug-report, concering to not showing a last or first sms-parts, i send my 0:\System\SMS folder, may be it will be helpful to you, BingK! Great, you did the number-item selection in main menu of elf! :-) Would you make also in "Others" choice items by number-presses? And some language correction to item "Statistics"
(*1) - count it, taking into account a 165-sms free patch, so, if we have it, just minus a sms count in SMS.dat from it. (*2) 4: is a disk, where a folder with Mss situated. This depends on Native AddressBook, so forget it IMHO. Format of lang.txt as in Ballet is f*ck*ng lame. Well, it was released in SMSman, but it's hard to explain...... }, for example, needs 2 symbols (1 rus sms with it can be only 69 symbols, not 70) So it won't be right ever (but SGOLD-phones knew this function fine). I support it. It's better to show name. And for * we need more data on sms (num, date-time, sms or mss, number of segments if sms) ... That's not the main thing anyway. etc... Never saw. If it is not so important or private, upload such mss-file here. It isn't real still to use any elf to send sms with query of report and to get report if browser is enabled. To read report (when browser is disabled), I think, my "Compact SMS report" patch mustn't be installed. Make it as middle-button menu entry "Translit", please. See in SMSman for working example. I always get pikoff on sending russian sms (Data_Abort! A0543EC8). If huteusz needs such function too, maybe it's better to use external translit tables from translit.txt like a structured file (\xC0=A) ?? Can you imagine something like this? when I have typed half an sms I pressed Back (Exit) and all message text had gone Need I explain why? 2 BingK: Hi,please a have one bug, if a Recieve SMS with more than 160 WordCount, than in SMS i have unknown symbols ""é@o0%" on start of SMS and start of second SMS (when begining 161 wordcount), do u know, where is the problem? Benlux - you are slovak / czech - yes ? I have this problem with these unexpected signs in ALL sms-es. Do you know, why? if i find a SetIconToHeader function, i would do that, but now it is too early to talk about that, you see, there are so many basic problems. save these characters to a txt-file with UNICODE-coded, and upload it here. would you mind i have a look at your sms.dat? maybe your problem is caused by the 165-sms-patch. it seems these two sms in your sms.dat are not completely received, so they are skipped. the elf read the sms depending on the function "SMS_DATA_ROOT *SmsDataRoot()". but i see it in simoco, it is completely received. and the first part of the first sms is not received. and the maxlen of the text of the sms the elf supported is 512.